Hill Farm Holiday, situated in the beautiful Cownwy Valley 3 miles from Lake Vyrnwy. Comfortable self-contained cottage with it's own private enterance and small verandah overlooking the garden. 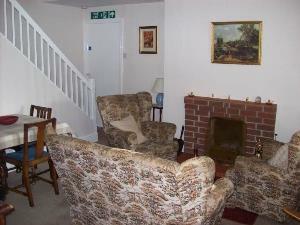 The cottage is fully heated with cosy open fire, large spacious fully equipped kitchen, bathroom with seperate shower. Local amenities consist of local workshops, crafts, RSPB Centre, tea rooms, local Hotel and pub, village shops. Ideal location for cycling, walking, birdwatching and relaxing with the scenic views. From Shrewsbury, take the A456 to Welshpool road, turning right onto B4393 (Following signs to Lake Vyrnwy), When approaching Lake Vyrnwy there is a sharp right hand bend, signposted Cownwy, turning left, follow the white Hill Farm Holiday signs. Nearest train station is Welshpool transport can be dicussed when booking.